In March, Deech Kirk, of the Center for Youth Ministry Training in Nashville, and I met in Atlanta to talk about all things youth ministry. We entered without any agenda. Well, not really. We both have things we would like to discuss and tell one another every time we meet. We just told each other we didn’t have any written agenda. And, so began our 24 hours of discussion on a wide range of topics. Deech is a friend. He and I started each of our organizations within a month of one another. At one point, we felt as if each organization would have a tighter relationship. Then other opportunities directed CYMT into a longer academic format while we gravitated more towards on-the-job training. Don’t get me wrong. Both have elements of both. However, our meeting in March revolved around the idea on how we can better help one another get better at training youth ministers. There are a few tangible results. CYMT has received training on how to develop youth ministers using our core competencies assessment. 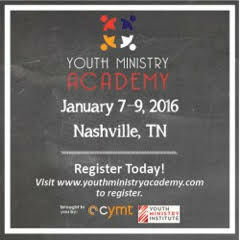 We also co-opted the name of our training conference, Youth Ministry Academy, for a January 7-9 event in Nashville. This event was held last year in Orlando. We hope that it becomes an annual event that moves between CYMT host cities and YMI host cities. It will be in Orlando February 1-4, 2017. In 2018 it may be in Austin. In 2019 it will probably debut in Kansas City. The idea is simple. Find new voices in youth ministry to keynote several TED style talks. In addition, utilize local talent within each geographical area to teach workshops and build relationships with other youth ministers. We want to expand our influence AND our network of people practicing exemplary youth ministry.